Just so you know, like Ecclesiastes and the Byrds said, for everything there is a season and a time. There is a time to live and a time to die. A time to sow and a time to reap. A time to buy an investment and a time to sell it. And, based on a tear-down 60 year old house in Vancouver selling today for somewhere around 1.2 million dollars, my spidey senses tell me that it may very well be a good time to sell! Buyers, although I’m sure your realtor will love to grab a buyer’s commission from you it might make sense to wait a month or so. Another analogy I heard which is great is that this is like a game of musical chairs. If you were planning on selling soon anyway, heck. Sell now. For older people, you may never see a peak like this again. Until then, everyone strap in and enjoy the roller coaster ride. Remember, like the famous bumper sticker says ‘cycles happen’. So you’re a residential agent in Vancouver board and you can’t find the new paragon login link? Good news. I’ve saved it in this post for you! If you are a commercial agent see this post. I was in the same boat and kept losing it and having to call the board for it. So, here you go. Save this in your bookmarks and have a nice day! Note again: If you are a commercial agent see this post. I’m admittedly not involved with politics as much as I should be. I’m involved in a few things but it’s not occupying much of my time. It’s quite rare that something happens in politics that makes me upset, but it’s even less often that something downright embarasses me about living in the region. Word on the street (and I didn’t verify this number with even a search engine search) was that it was going to cost $150,000.00 of taxpayer money, too. For the first time *ever* I considered moving to Toronto – and I’m not even joking. Or with my wife back to her native country in Asia. Where else in the *world* would this kind of sick wastage occur without authorization? Where else in the *world* would countless thousands of bridge users be inconvenienced, forced in extra traffic, and asked to use a different bridge to go home later to their families while a few people stretch and sweat on a bridge? Have you heard of the Vancouver Art Gallery? The pot smokers find it quite acceptable, you know. Are you more enlightened than Marc Emery? Seriously, you should quit. And I mean that. It’s time. If you are given any more time, you are surely going to go down in infamy. At least now, your kids will be able to laugh this off (do you have kids?) and it will be a family har-har over Christmas dinner for the next 20 years. But what’s next? Are you going to close down YVR for a Falun Gong meditation? How about parking a big air mattress in front of the BC Ferry terminals and do some Tai Chi stretches on them? You would inconvenience fewer people there than shutting down the Burrard Street bridge, I’m guessing. I’ve quit before. One time I was a waiter and I kept dropping plates and making personal jokes about the patrons that they didn’t find funny. I knew it wasn’t for me. I quit. I moved on. Don’t ruin what’s left of the BC Liberals. There aren’t a lot of other options to choose! If you don’t, I’m seriously going to run for Premier. Not because I want to, but because I *have* to for our future’s sake. So you’re a commercial agent in Vancouver board and you can’t find the new paragon login link? Good news. I’ve saved it in this post for you! Note: if you are a residential agent, see this post. Note again: if you are a residential agent, see this post. 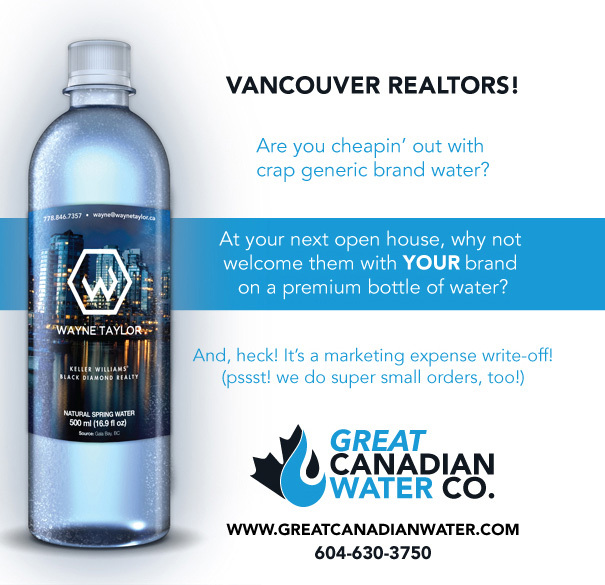 And now a word from our sponsor Great Canadian Water! For How Long Will Translink Remain a Shame? After reading it and voting ‘no’, it made me think about how long Translink has sucked. I was born and raised in this town and I’m allowed to speak now seeing that more than half of my head is grey. I mean… everyone who has been here more than a couple of years knows Translink wastes money. Everyone knows Translink’s leaders get paid too much. Everyone knows our Translink’s systems are under par considering the above expenses. So, what really needs to happen ASAP, if we want to have a great public transportation system (FYI I am in full support of this) and not go bankrupt doing it, is the total annihilation of Translink as we know it, and start it from scratch. I’m talking about a full gutting. And I’m talking about full, 100% disclosure to and dialogue with (in plain street /ESL level English) us – the lowly public. Then we’d be a city to talk about. Can I get an “amen” someone? Yeah! That’s what I’m talkin’ bout! “Chewy Junior” – There’s just something awesome in the name. I’m not sure if it sounds ‘saucy’ or ‘childish’, but no matter what, whenever I tell my friends I’m going to Chewy Junior, by far Canada’s most exciting franchised food and beverage business to open in recent history, they look at me funny. But that all ends when I flip them a Chewy. They clam up when I get all Junior on them. Well, maybe linguistics and Asian culture don’t amuse you like they do me. Maybe you just want to go out and have something that’s sweet, high quality, and actually gets you excited? Then Chewy Junior is for you. Not only are they the most delicious looking cream puff balls I’ve ever laid my eyes on, but they taste even better than they look. This is rarely the case. I was so sick and tired of having to both eat and take for others to eat Tim Horton’s trash. Not only did I feel bad about giving them something that tasted like last week’s stale bread deep fried with sugar on top, but I just felt kind of guilty in general about the health aspect. I feel as if I’m reaching deep into their heart and jamming a wad of sugar lard in their heart tubes (I think they have a better name than that…). Then along walks Chewy Junior into my life. They cost well under $3.00 each and they taste like $5.00 + (and I’m cheap). I had the privilege of meeting Ashvin Abraham while he was doing his soft launch on Cordova and Richards and he said he will be willing to be interviewed on video for me without any scripts. So look out for that soon. So, go ahead, get on the Skytrain and get off on the last stop, walk across the road, hand over your money and get ready to make a lot of friends and influence people. I guarantee if you brought these to your next business presentation you would have a 78% better closing ratio, by the way. These aren’t good. These are Chewy. I was a franchisee of a big coffee chain for many years in Vancouver. To sum up the story, it ended ugly and I was shocked that I had involved myself with such a system. But actually, I’m not shocked at all – I was completely ignorant. And that really got me thinking. Why was someone as ignorant about this particular business as myself allowed to purchase something for so much money and subject to lose it all? I was *specifically chosen* to suffer and die [in the business sense]. Those ‘dem there are loaded words, Wayne! Yes, they are. And I believe them even more when I say them. It won’t take long for you to notice what I noticed if you aren’t personally involved. If you are a franchisee as you read this, you will be in a certain amount of denial until the resurrection that follows your franchise death and funeral. The death may be the sale of your business or the total loss of it. The funeral will be the period of time when you mourn over the wasted time and money, but thank God for your character growth and increased wisdom because, for many of us, that’s all we have left. immigrants were well-favoured – yet certain kinds and not others. Very few of these folk had the ability to craft well written communications that would stand up powerfully in a court of law, or defend themselves verbally for that matter. most franchisees demonstrated fear whether it be their personality type or their position in relation to the franchisor. all franchisees underwent a ‘personality test’ which tended to produce franchisees that, even when outraged, never really ‘fight’. They might yell, but they don’t fight. They might have bark, but they don’t have bite. Just as a company has the right to secretly select a blue eyed, blond haired young female with nice curves to serve their customers food, so does a franchisor have the ability to cherry pick the ‘perfect victim’ to fit into the cogwheels of their financial death machines. Wayne! You’re so cynical! Are all franchises really that bad? No. They aren’t and thank goodness. But you absolutely *must* be aware of chains that partake in such cherry-picking in order to remain in a position of dominance and ultimate power.